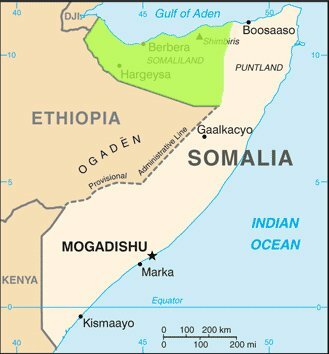 After Somalia President Hassan Shiekh Mohamud’s speech at the United Nations General Assembly, in which he promised that Somalia would be reunified by 2016, Somaliland President Ahmed Mohamed Mohamud Silaanyo clarified that his administration would not countenance this option. To the contrary, Somaliland is pursuing international recognition and will defend its independence. RBC Radio: The breakaway Somali state of Somaliland president Ahmed Mohamed Mohamud Silaanyo has assured Somali president Hassan Shiekh Mohamud that his administration will only work towards gaining independence and international recognition, and will never re-unite with the rest of Somalia. Silaanyo, speaking at a graduation ceremony held for students graduating from Hargaisa University, said that Somaliland is an independent country and Somalia president Mohamud is in a deep dream as far as Somali unity is concerned. He stated that the people of Somaliland are reaping their independence from the rest of Somalia and they will only work towards getting recognition from the world. Silaanyo indicated that Somali unity has failed and Somaliland will never again re-unite with the rest of Somalia. He added that the people of Somaliland would fight anyone who tries to intervene in their territory. He finally highlighted that Somalia president Hassan Shiekh Mohamud is not willing to continue talks with Somaliland, and called on him to engage in such talks, which he said would address Somaliland’s independence. This came after Somalia president Hassan Shiekh Mohamud addressed the international community in the United Nations General Assembly in New York and assured them Somalia would be united in 2016.